PBS Masterpiece Mystery! 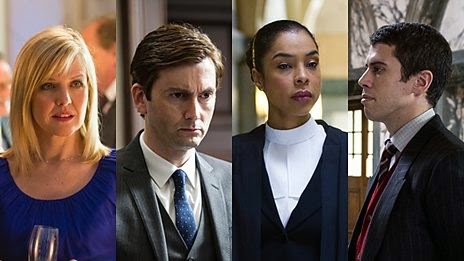 starts a new three part series tomorrow night -- The Escape Artist -- starring David Tennant (Dr. Who & Barty Crouch Jr in Harry Potter and the Goblet of Fire), Toby Kebbell, Sophie Okenedo (After Earth, Hotel Rwanda) and Ashley Jensen (Ugly Betty). Talented junior barrister Will Burton (Tennant) specialises in spiriting people out of tight legal corners, hence his nickname - the Escape Artist. But when Will's talents acquit his latest client of a brutal and high-profile murder, the consequences are chilling. Other mystery TV premieres this week include the return of Rizzoli & Isles on Tuesday on TNT followed by Perception. Can't wait, DVR is set. I've never seen this but I love Rizzoli.